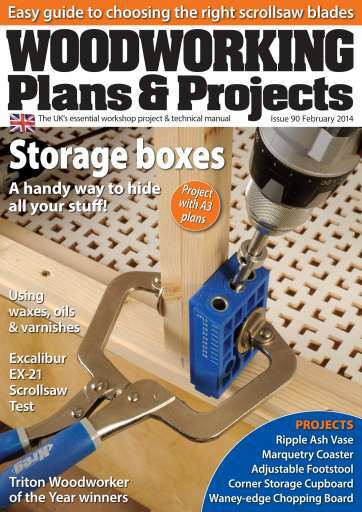 Welcome to the February issue of WPP! 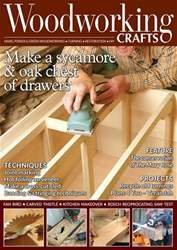 This month, we have a great selection of projects for you to make, including Amber Bailey’s marquetry coaster; Anthony Bailey makes some natural-edge chopping boards for the kitchen; in RouterCentric the Editor makes an attractive storage box; Maker Baker shows you how to turn your very own ripple ash vase and Simon Rodway offers some corner storage solutions in Plans 4 You. 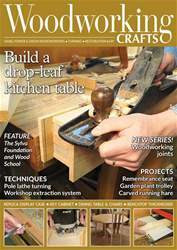 In our techniques section, scrollsaw expert Roger Buse has a great article on choosing scrollsaw blades and offers some top tips on using them; in DIY Fixes, we show you how to repair a window frame; the Editor talks waxes, oils and varnishes in our finishing series before he offers some practical advice on installing bench dogs. 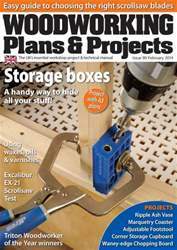 In Kit & Tools, we’re back to scrollsaws and put the Excalibur EX-21 through its paces; in Craftsman’s Corner we look at the new LTX 28V brushless drill from Metabo and Geoffrey Laycock tests the Axminster AW 128PT trade-rated planer/thicknesser; we also bring you the latest tools in Hot Stuff. 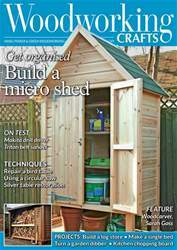 In terms of Features, Amber Bailey meets the Buckinghamshire design collective Crafty Little Makers; we finally announce the winners of the Triton Woodworker and Triton Young Woodworker of the Year competitions; Tegan Foley and Derek Jones review some new books for you to enjoy and in Tools of Yesteryear, Anthony Bailey looks at the Paramo Planemaster. We also have all your favourite pages in our ‘Regulars’ section. All this and more in WPP 90!